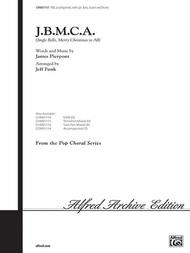 Composed by James Pierpont (1822-1893). Arranged by Jeff Funk. Performance Music Ensemble; Single Titles. Alfred Archive Edition: Alfred Pop Choral Series. Christmas; Novelty; Secular; Winter. Choral Octavo. 12 pages. Alfred Music #00-CHM01117. Published by Alfred Music (AP.CHM01117). Just when you thought you'd heard everything! Here's the freshest approach to "Jingle Bells" you've ever heard. Combine the driving rhythms of "YMCA" together with the traditional "Jingle Bells" and you get "J.B.M.C.A. ".